I looked at these two old keys in my hand. 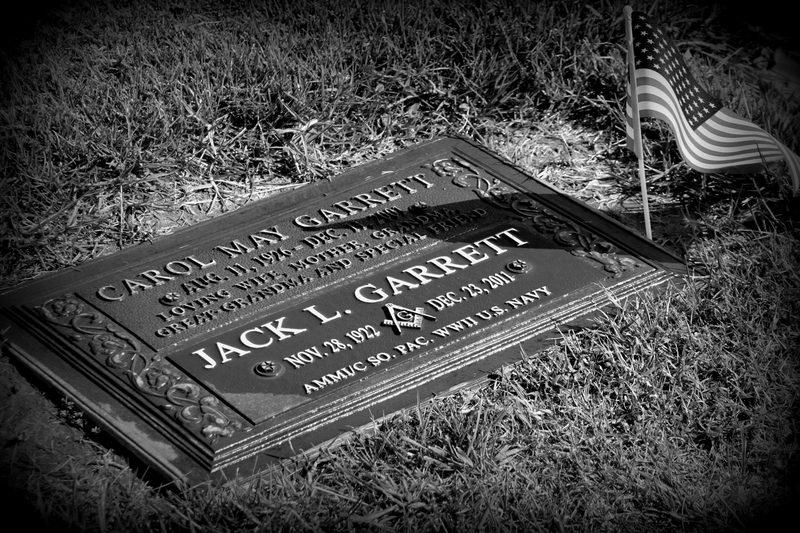 They belonged to Old Man Jack and the thought of Memorial Day instantly crossed my mind. Two old keys to Memorial Day. A year ago, I had written a blog about Memorial Day (“It” and Memorial Day). 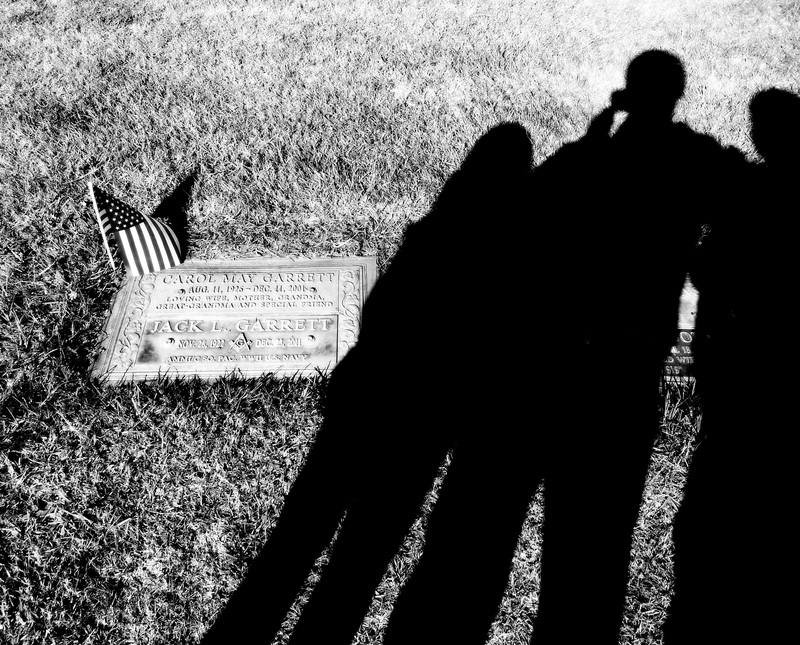 At times, I feel the meaning of Memorial Day has either faded or has changed. In essence, many people living in today’s “politically correct” society have taken the sacrifices of our fallen to mean a three day weekend. Sad…but that’s how I feel.. and it angers me. When I looked at those two keys, my mind raced to some of the things Old Man Jack said. But mostly, to the things he could not say. 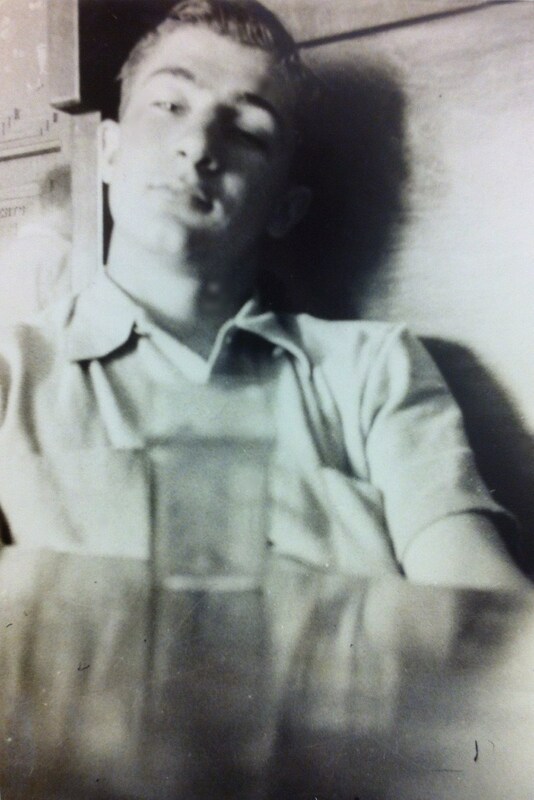 In the twelve years I was honored to know him, he would abruptly blurt out something once in a while when we were talking in his garage… while sitting in the blue wheelchair that belonged to his wife. There was no story associated with these mutterings. “Boys got killed on those stinkin’ islands…” then raise his thick, white eyebrows. Or once in a while, he would make a muffled smack with his lips then slowly shake his head left and right… and not say anything more. One such utterance was mentioned in “Old Man Jack’s Love”. 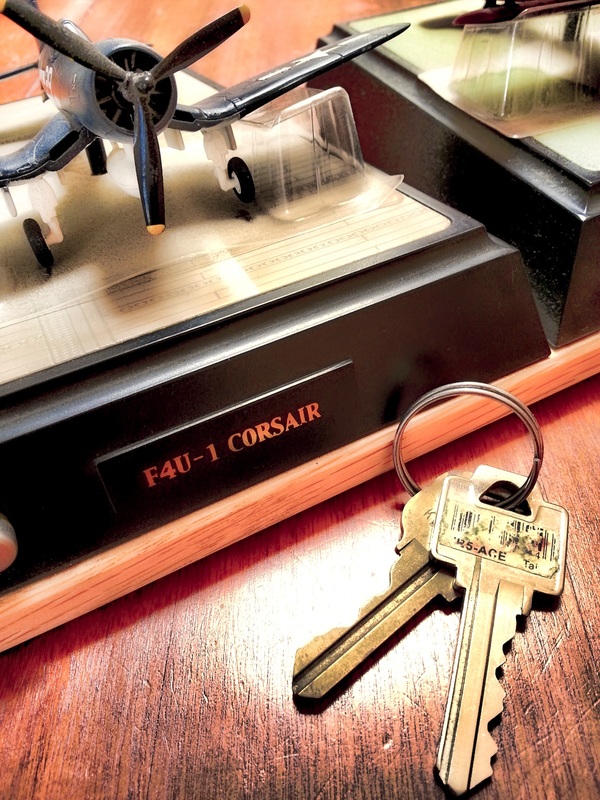 Upon gazing upon his beloved Corsair in front of him after over 60 years, he began weeping. 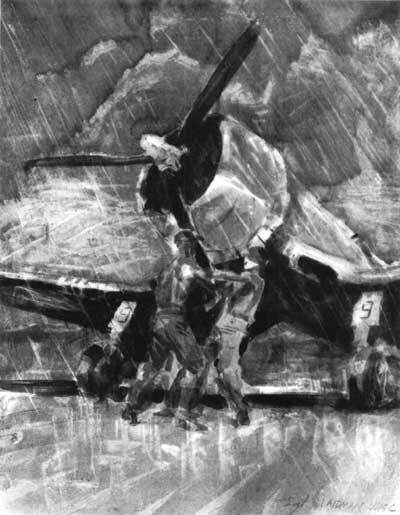 Ground crew working on a Corsair in heavy rain. He said that because as Ground Crew Chief, he was responsible for the airworthiness of the plane a young Navy or Marine pilot would take out on a mission…to shoot at the enemy…or be shot at. These planes had to be in the best fighting condition as lives depended on it. But he frequently said “they had to make do” because they never had enough spare parts… so they HAD to improvise. One time, he said a bushing had been shot out on a plane that had to go on a mission the next morning. Old Man Jack did what he could. What he must. He soaked two pieces of coconut logs in engine oil overnight. When it came time for the pilot to take off, he clamped the oil soaked wood around the cabling and used baling wire to clamp them together as tightly as he could. The plane left on its mission – with the young pilot behind the stick…in a plane with oil soaked coconut log as a bushing. 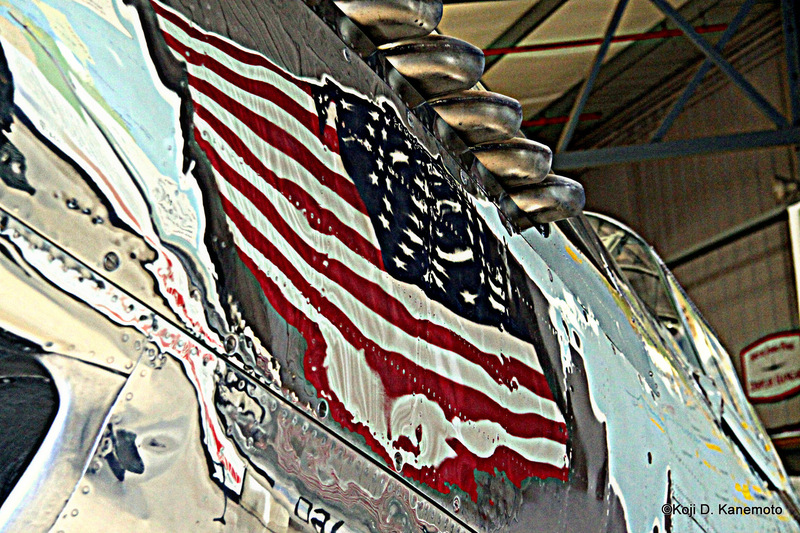 Old Glory shimmering off a P-51 Mustang at the Chino Planes of Fame Museum. I will never have an answer because the question could never have been asked of him. But I feel Old Man Jack carried tremendous guilt in his heart about something that happened on those stinkin’ islands. Not just bad; real bad. Deep down, my heart tugs at me that someone within Old Man Jack’s reach died that shouldn’t have… and that Old Man Jack feels personally responsible for his death… and he carried that anguish for all these years. As Old Man Jack said, some of the young pilots didn’t come back. They were killed or are forever missing in action. That is for whom Memorial Day is all about. To remember and honor those that did not come back…and not a Memorial Day sale. If your eyes don’t spring a leak, there is something amiss… like with our current administration. It really says something when your own country can’t afford a flyover for a rare duo burial. As we saw in Part 3, Japan and America are now at war. While not directly related to the question of “What did FDR know?”, it is deemed critical for readers to understand the damages suffered by the US military – and specifically its naval and air assets – on December 7, 1941. It is also important to realize the huge advantage the Japanese Imperial Navy had over the U.S. Navy. Lastly, it is important for readers to note the unbridled successes of the Japanese military at that time… and what unbelievably followed. For the vast majority, Americans are under the belief that the US was caught flat-footed with the surprise attack on Pearl Harbor. 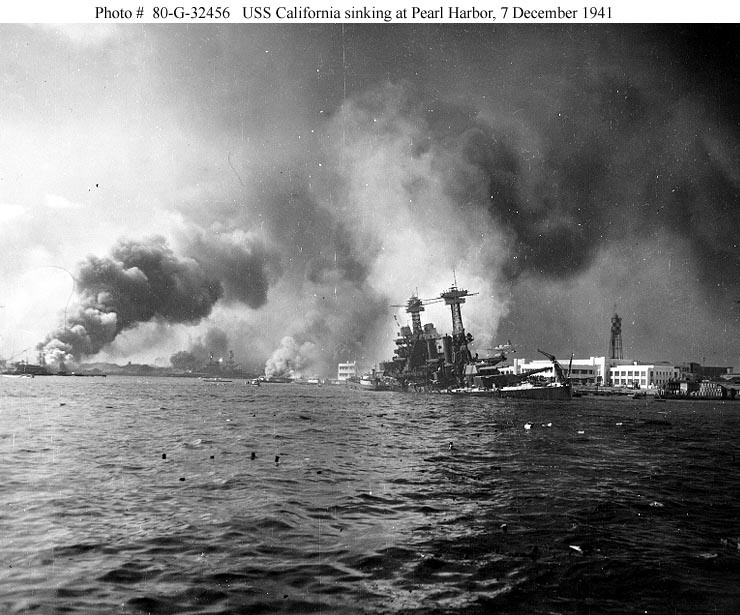 Indeed, 21 ships of the U.S. Pacific Fleet were sunk or damaged. The USS Utah – also considered obsolete. In addition, the US had 188 aircraft destroyed plus 159 were damaged; the majority were hit before they had a chance to take off. 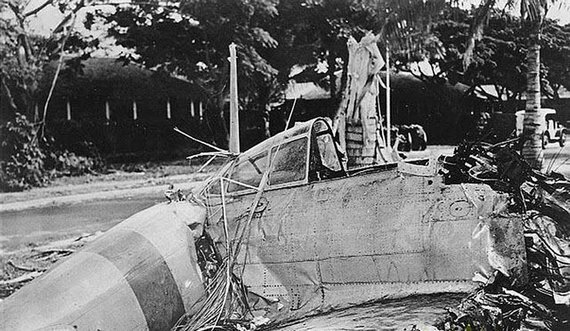 A downed Zero in a Hawaiian neighborhood. Japanese naval forces sailing for the raid included four heavy aircraft carriers, two battleships, two heavy cruisers, two light cruisers, 35 submarines, and 11 destroyers. Indeed, a powerful fleet projecting tremendous offensive firepower. All survived unscathed; all but 29 Japanese aircraft returned to their carriers. In the Pacific Theater, Japanese forces were rolling over Allied forces at will with victories in Thailand, Malaya, Wake Island, Guam Island, the Philippines, Hong Kong, Singapore, Burma, Dutch Indonesia and the invasion New Guinea. The Imperial Japanese Navy dominated in the Pacific, attacking Allied bases in Australia and Ceylon; they even bombed or shelled coast of North America at will albeit with minimal effect. But, the great sea battle of the Coral Sea and more specifically at Midway essentially put a halt to the wave of Japanese victories… barely five months after Pearl Harbor. How could that possibly be? Wasn’t our Pacific fleet crippled? Were American aircraft and ships better than their Japanese counterparts? No, production of new classes of ships and aircraft would not arrive in the Pacific until 1943. Did American forces have more men, aircraft and ships? Again no, the tide of the American industrial strength would not be felt in the Pacific until 1943. Was it better leadership? No. Admiral Chester W. Nimitz was arguably equally matched by Admiral Isoroku Yamamoto, the overall commander of Japanese forces during the battles of Coral Sea and Midway. Did our navy stumble upon the enemy out in the Pacific by sheer luck or happenstance? If it wasn’t the above, how was the US Navy able to engage the Imperial Japanese Navy at Coral Sea and Midway then stop them? Battle of the Coral Sea, May 1942. Source: Pacific War Museum. By March 13, 1942, OP-G-20 had completely broken JN-25. Until then, about 10% to 15% of a JN-25 message that was intercepted could be read. (2) However, enough could be deciphered to understand the Japanese were gearing up to attack Port Moresby in Papua, New Guinea on May 7, 1942. 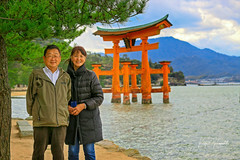 By taking Port Moresby, Japan could extend its reach beyond northern Australia and further south. 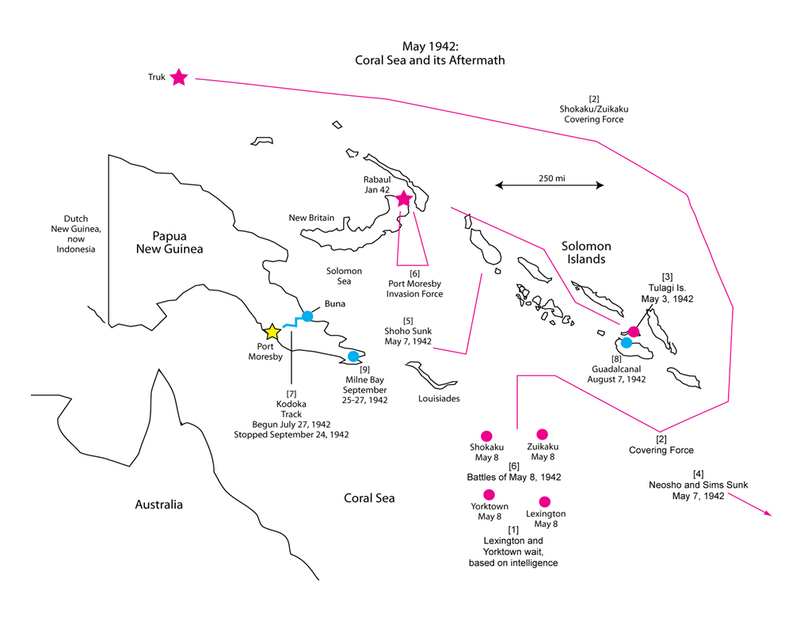 Upon receiving the intelligence from the deciphered JN-25 messages, Admiral Chester Nimitz decided to move a fleet into position in between Port Moresby and Australia. He issued such orders on April 17, 1942. However, he had but two carriers available for action – the USS Lexington and the USS Yorktown. This battle was definitely NOT a chance encounter; it was planned. With but two carriers and support ships, the US fleet was outgunned especially considering our aircraft was obsolete. The Japanese fleet sailed with a Shoho (a carrier), several cruisers and destroyers, and a dozen transports filled with troops. A smaller invasion force would move down the Solomons, which laid on New Guinea’s eastern flank, with the target being Tulagi. To protect these two invasion fleets, the Japanese carriers Zuikaku and Shokaku would spearhead yet a third fleet to provide air protection. 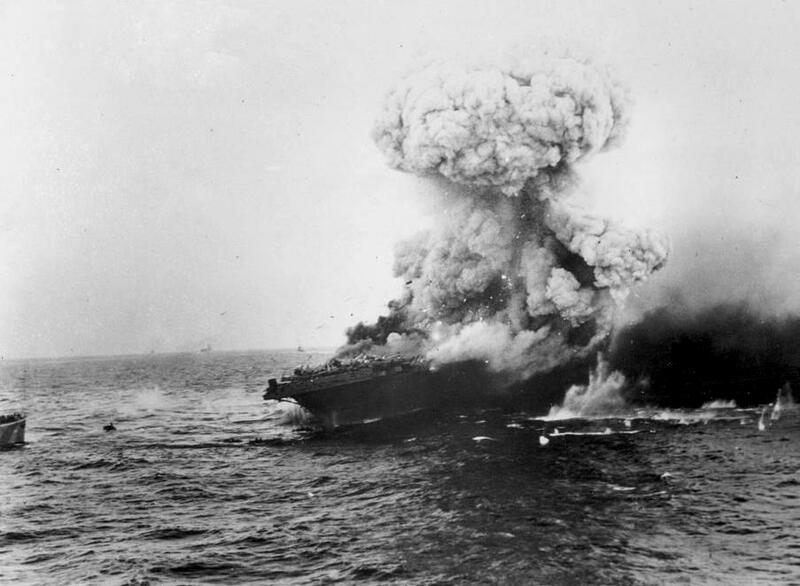 While the ensuing two-day Battle of Coral Sea was considered a draw, U.S. forces inflicted enough damage on the Japanese navy to force it to withdraw. In addition, as the Japanese were unable to secure the port, their military was forced to fight in land warfare, which proved disastrous for the Japanese. Of most importance, the fruit of the battle saw the Japanese carrier Shoho sunk, with both the Zuikaku and Shokaku damaged and forced to retire. Therefore, they were made unavailable for the critical Battle of Midway, just about four weeks later. However, we lost the USS Lexington, a major loss. And while the USS Yorktown suffered heavy damage as well, the Japanese believed her to have been sunk; instead, the USS Yorktown was made seaworthy through the extreme efforts of repair crews at Pearl Harbor. While two weeks had been estimated for repairs, the repair crews had her back on the seas in just 48 hours. This strategic victory was made entirely possible because of secret MAGIC intercepts. The Japanese still did not believe their complex JN-25 had been broken. Arguably, the paramount triumph from the breaking of JN-25 on March 13, 1942 was the Battle of Midway. This is one battle that my neighbor, Mr. Johnson, fought on board the USS Enterprise as a very young US Marine. From decrypting the Japanese naval messages, the U.S. naval commanders knew the general battle plans of Admiral Yamamoto – even the timetable. Yamamoto’s strategy was to have aircraft carrier task forces launch both a diversionary raid off the Aleutian Islands then lure the U.S. Navy to Midway Island. His goal was to decimate once and for all what remained of the American fleet after Pearl Harbor. Yes, the deciphered intercepts did not state in the clear Midway was the target; the messages simply designated “AF.” While CINCPAC felt strongly it was Midway, it was Captain Joseph Rochefort of OP-20-G who wily suggested how to establish for certain what “AF” stood for. 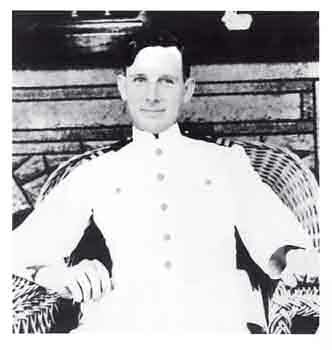 Rochefort was Officer in Charge (OIC) of Station Hypo in Pearl Harbor, the nerve station in Hawaii for deciphering JN-25 intercepts. 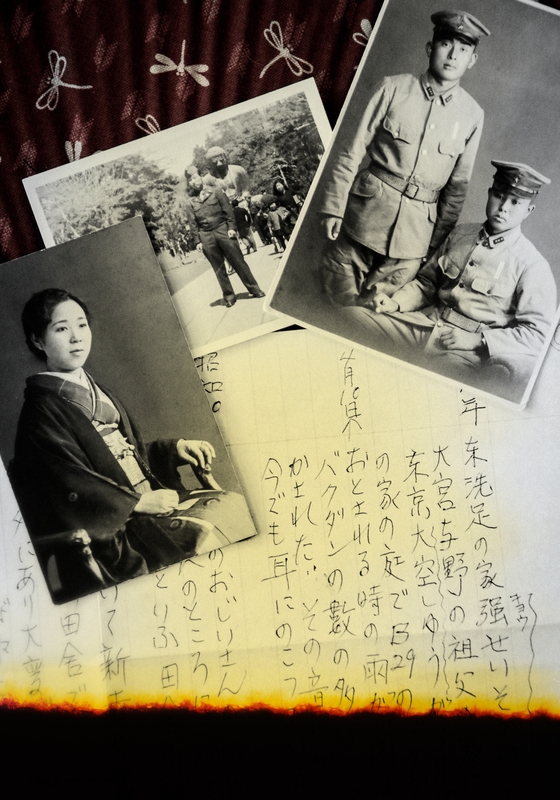 An expert Japanese linguist and during the most critical month of May 1942, Rochefort reviewed, analyzed, and reported on as many as 140 decrypted messages per day. These reports were directly piped to the highest-ranking fleet commanders. He brilliantly strategized for American forces on Midway to send out a radio message saying that they were running short of fresh water. Rochefort and his group waited anxiously to see if Japan would take the bait. Finally, OP-G-20 intercepted a Japanese message: AF was running short of fresh water. Establishing Midway as the target, the U.S. Navy assembled what it could. America was still short on capital ships and better aircraft. After a 48 hour turnaround, the USS Yorktown joined the USS Enterprise and USS Hornet. While remembering that by virtue of deciphering coded Japanese messages, the Japanese Imperial Navy had three less carriers to deploy after their losses at Coral Sea – a very critical fact. After a fierce three-day battle at Midway, U.S. naval aviators sank all four Japanese aircraft carriers in Yamamoto’s task force – the Hiryu, Soryu, Akagi and Kaga. 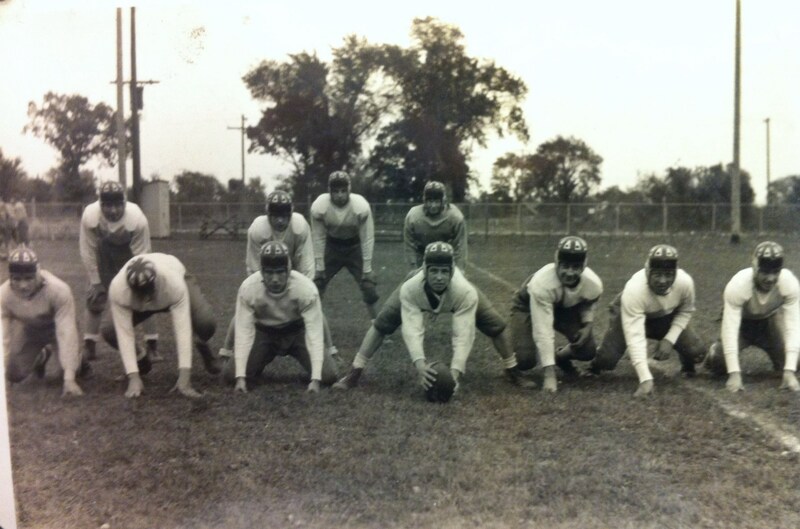 All four participated in the assault on Pearl Harbor, effectively turning the tide in the Pacific. Yes, luck was involved during the actual battle but certainly, the courage of our young men at sea and in the air was incredible. They had proven themselves but at great cost in lives and materiel… including the USS Yorktown. 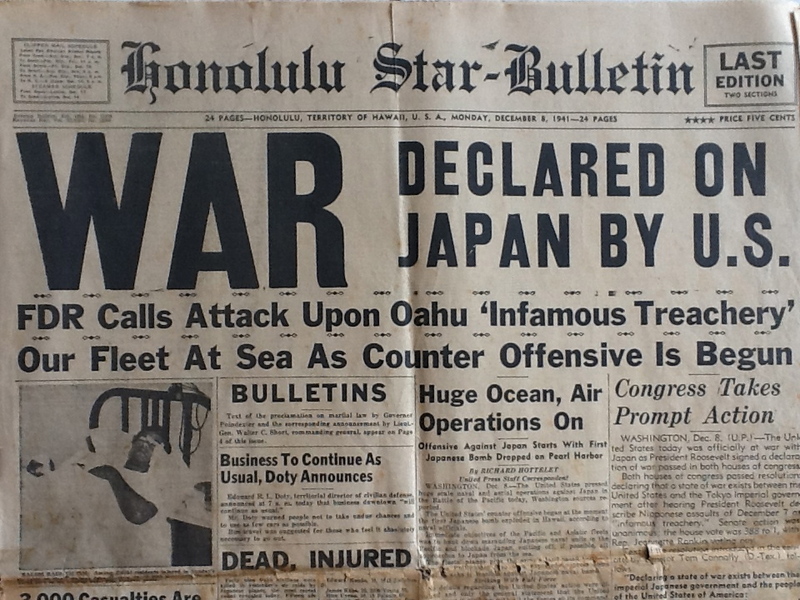 Unbelievably, the Chicago Tribune published a darned story revealing that the U.S. had known about Japanese battle plans in advance. They had, in effect, revealed that JN–25 had been broken. 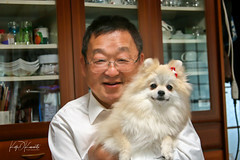 Inexplicably, key Japanese leaders never found out about the article. Darned media – even back then. 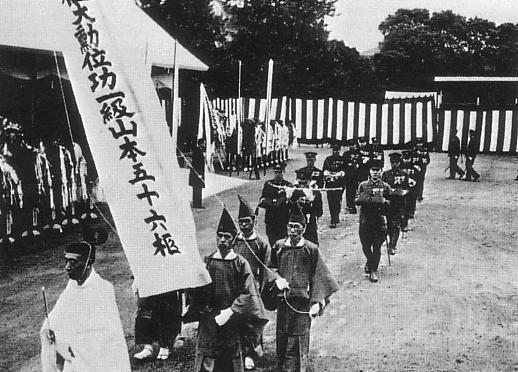 State funeral procession for Admiral Yamamoto, 1943. As school history books had once shown, the battle planner of the Pearl Harbor attack was Admiral Yamamoto. He did know of the might of the U.S. having attended Harvard University – yes, Harvard – from 1919 to 1921, studying English. He did, in fact, oppose taking on the U.S. But Yamamoto had one trait which would lead directly to his death: his intense desire to be punctual. The US counted on this. Codebreakers intercepted then learned after deciphering messages that the admiral was scheduled to inspect a naval base on Bougainville in the Solomon Islands on April 18, 1943. The detail even included his minute by minute itinerary. 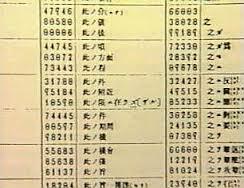 Some top US officials were hesitant to use this information for fear that doing so would tip off the Japanese that their codes had been broken. 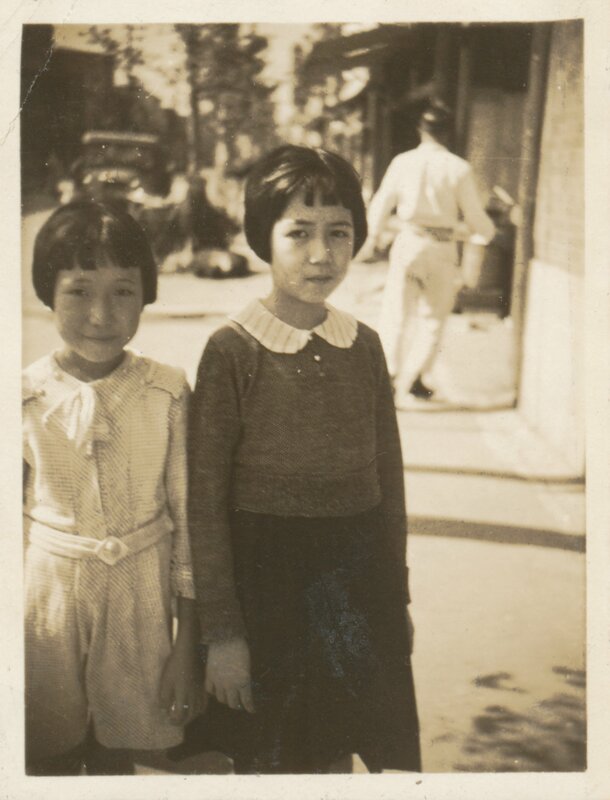 Nevertheless, the decision was made to assassinate Yamamoto. That morning, eighteen P–38 fighters left their base at Guadalcanal at the other end of the Solomon chain and arrived at Bougainville precisely ten minutes before Yamamoto’s plane was making its approach. The admiral was killed in the attack, depriving Japan of its most experienced and accomplished admiral and sapping Japanese morale. To mislead the Japanese that the fighters had arrived purely by chance, the air force flew other risky patrols to the area, both before and after the attack. It was not a “one shot in the dark” mission. It was deeply thought over and planned out – because we were able to intercept and decipher coded Japanese messages. (3) They also spread “rumors” that the information was from coast watchers. Early in 1942, Japan decided to block the Allies from setting up bases in Australia. Operation MO would send a large invasion force to Port Moresby, the capital of New Guinea. From Port Moresby, the Japanese would be able to project air power beyond the northern tip of Australia and establish bases even further south (Hearn). The Port Moresby landing force sailed with about a dozen transports filled with troops, several cruisers and destroyers, and a half-size carrier, Shoho (Bennett, Hearn). A smaller invasion force would move down the Solomons, which lay on New Guinea’s eastern flank. 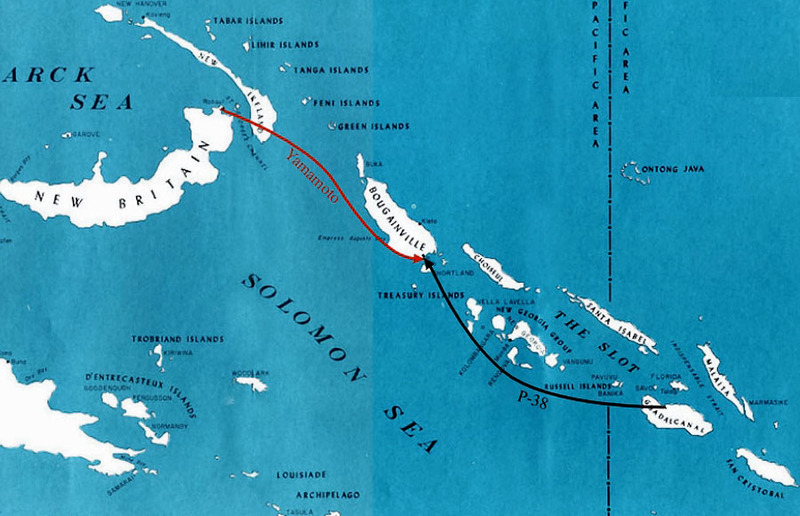 The specific target in the Solomons was Tulagi, which was the colonial capital. To protect these two invasion fleets, Zuikaku and Shokaku would lead a separate covering force to create a blanket of air protection (Bennett). By March 1942, the United States had cracked part of the current Japanese Naval (JN) code, JN-25. However, U.S. intelligence could intercept only about 60 percent of all Japanese transmissions and had the resources to analyze only about 40 percent of the messages it did intercept (Parshall and Tully). Even then, code breakers typically could read only 10 to 15 percent of the code groups in a message (Parshall and Tully). U.S. intelligence primarily used direction-finding equipment to learn where many Japanese ships were and where they were heading (Parshall and Tully). 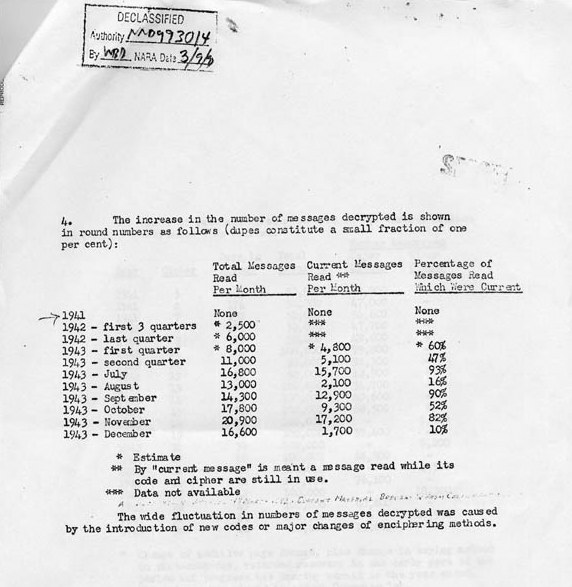 Beginning on April 16, U.S. intelligence began using this spotty information to piece together an understanding of a Japanese plan to move south with carriers (Parshall and Tully). On April 17, Nimitz ordered the carrier Lexington to join Yorktown in the Coral Sea (Bennett). If Halsey had been able to move Enterprise and Hornet there too, the U.S. might have been able to destroy the Japanese fleet. But Enterprise and Hornet needed refitting after the Doolittle raid of April 18, 1942, and could not get there in time for the fight (Parshall and Tully). The importance of MAGIC and the breaking of the “Purple” Japanese consulate code cannot be understated. For non-historian readers, the reach and military value extends far beyond the waters of the Pacific. It extends to Europe…specifically D-Day and the shores of Normandy. Per “What Did FDR Know? 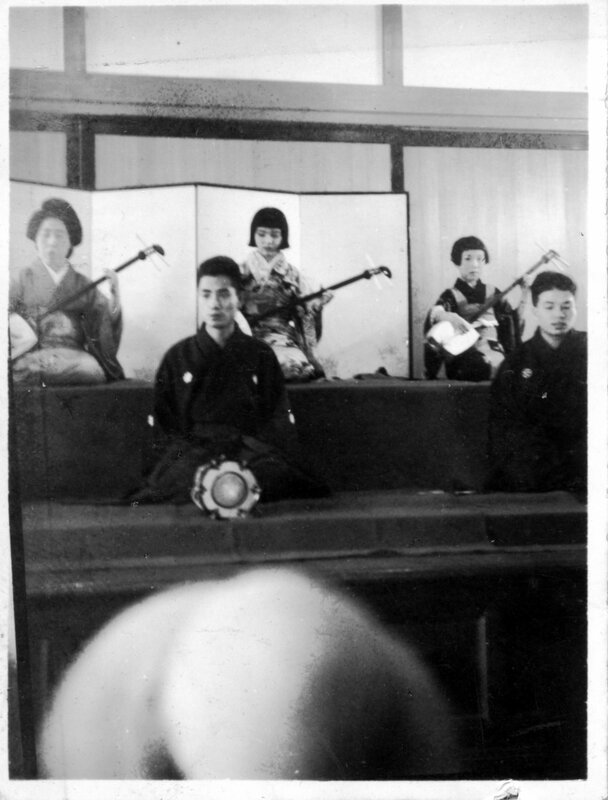 – Part 1”, Baron Hiroshi Oshima was the Japanese envoy to Berlin and used his Purple machine to communicate frequently with Tokyo. Luckily for the US, Oshima was also an Imperial Army colonel at the time of appointment and loved war strategy and armaments. He followed intimately the German conquests in Europe and their latest technologies. 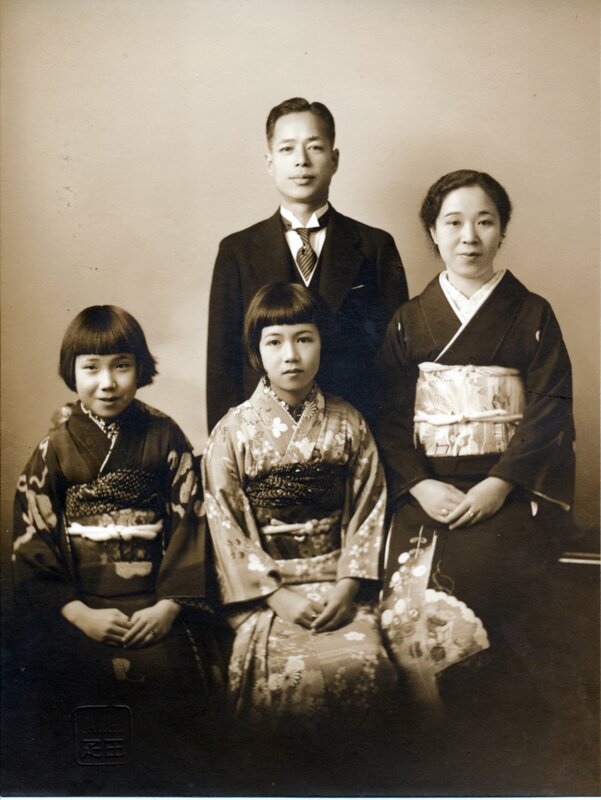 He sent very detailed reports to his superiors in Tokyo of what he had learned using the purple cipher machine, which the US was able to intercept and decipher immediately. 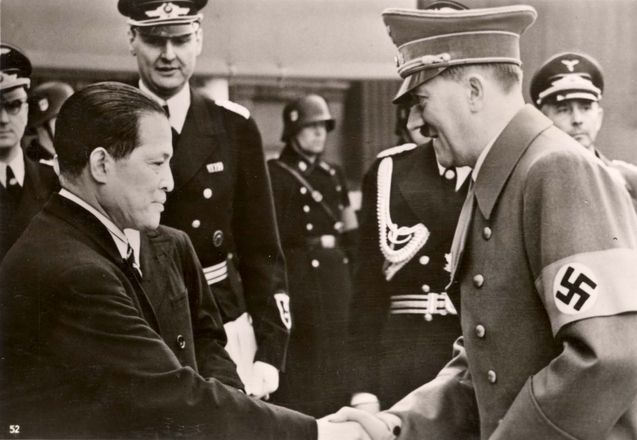 And while the public is led to believe the U.S. did not know if the German commanders took the bait that the D-Day invasion would take place at Pas-de-Calais, Oshima secretly gave the US confidence that the Germans had taken the deception through his messages to Tokyo. The Nazis were preparing for the landing at the wrong beaches. (Note: this is not to lessen the somberness of those killed or missing in action at Normandy. Further, this is not to lessen the importance of wartime security.) Further, with their true belief that the invasion at Normandy was a diversion, the Panzer divisions were not immediately released to engage the Allied invading forces until too late. Why did the U.S. decide to take intense preparatory military action for Coral Sea based only on partial deciphers of JN-25? As stated, OP-20-G did not break JN-25 completely until March 1942. However, OP-20-G was able to adequately decipher JN-25 messages – even one sent by Yamamoto himself – only until about one week before Pearl Harbor when a code key was changed. What could the reasons be for the U.S. not taking similar defensive or offensive action at Pearl Harbor before the actual attack commenced? Was it because of incomplete intel? Were deciphered messages not of importance to FDR… or they not reach FDR at all? Were diplomatic deciphers not important? Did top brass feel their carriers would be sunk facing tremendous attacks and therefore, the Pacific War would be lost from the get-go? Or…? Of course, there can be as many reasons as there are people. (2) “At the Interface” documentary based on interviews of Donald M. Showers, USN, ret. (3) Public teaching in the past was true at the surface – that the US had intercepted a radio message “sent out in the open” by a brash young officer. Now you know it was the work of cryptanalysts working under tremendous secrecy. Loyal readers know of my love for WWII combat veteran “Old Man Jack”. 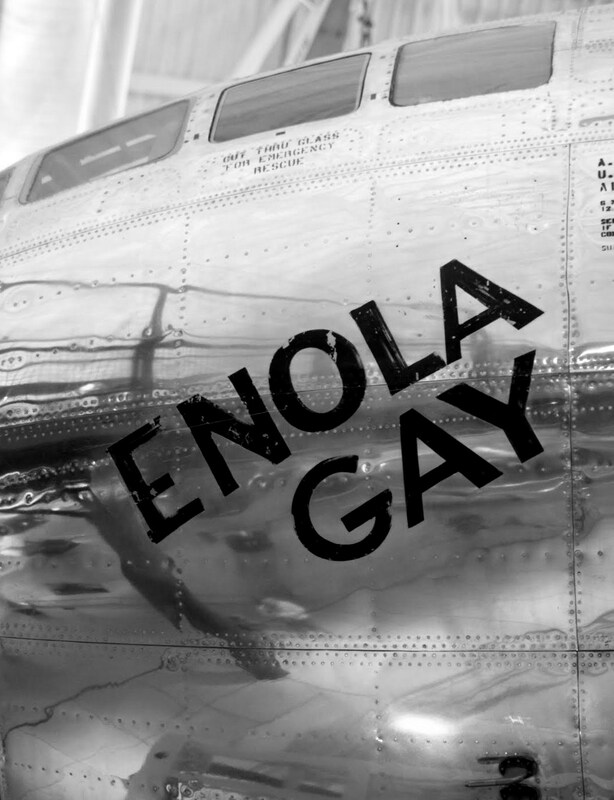 The Enola Gay (For a short computer animation of the atomic bomb’s explosion, please click. 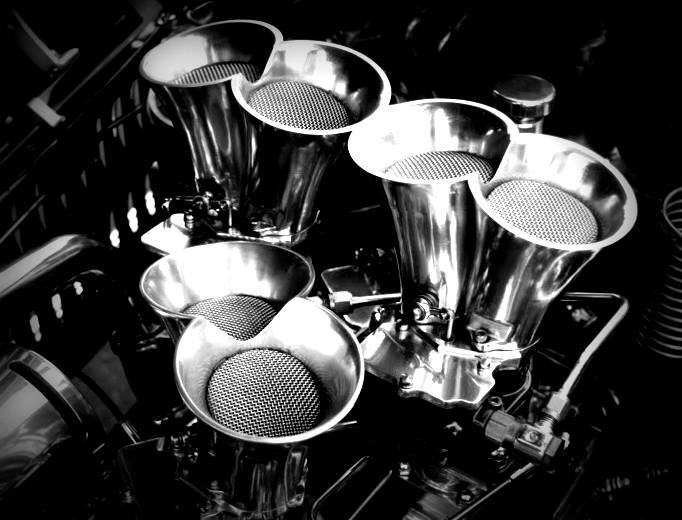 Custom downdraft carburetors in a hot rod. 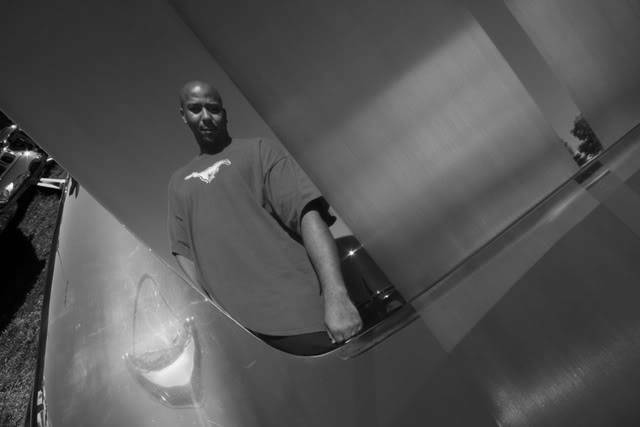 My car enthusiast bud Prof. Arnold is reflecting off a meticulously polished all-aluminum Cobra. That’s the hood’s surface propped open, folks. Steven F. Udvar-Hazy Center, part of the Smithsonian Museums. Here’s an entry in response to “Cee’s Fun Foto Challenge” entry: Patterns. 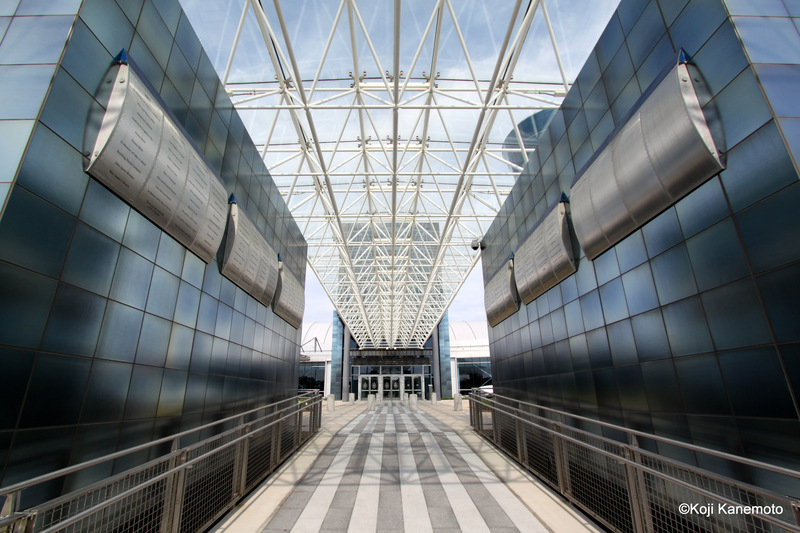 The entry way is so serene yet powerful and honors all aviators.